I live in Merchtem of Belgium and work for more than 40 years as an independent physiotherapist. During my interimship as physiotherapist student in 1978 in Israel, I came in contact with diving during a weekend trip to Eilad at the Red Sea. This experience has never gone out of my head and in 1992 I begun the training for diving. 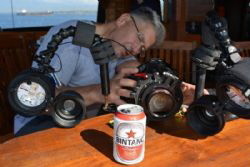 In 2005 started also with underwater photography. First with a small compact camera. With the years I have developed this into a high quality digital camera with a special underwater housing and provided with the necessary lights and strobes for illumination and different lenses. (Olympus OM-D E-M1 Mark II - V6K Supe lights - strobes inon D2000). For the finishing touch I use the software program "light room".